We can use the same skills for IBM i, Windows, web and mobile solutions, keeping our team lean. Customer Baustoff Union is a leading provider of building materials, construction services and equipment rental services in Germany. Challenge The need to innovate in order to improve customer service, while avoiding the risk of disruption and errors an ERP overhaul may cause. Solution Use the ERP solution from LANSA partner SMH and follow their low risk approach to progressively modernize, add and replace functionality. Key Benefits Better customer service and exceptional growth through integration with TomTom WEBFLEET, EDI/XML and other format transacting, mobile access to remote staff, dashboards with Excel integration, and so on. Many LANSA customers and partners have solutions in place that just keep on working and evolving over the years to stay in tune with the company's business needs and market opportunities. Here is one of those success stories, by LANSA's German business partner S.M.Hartmann (SMH), illustrating it has been smooth sailing on the IT front for its customer Baustoff Union for over 15 years. Baustoff Union (BU) started using the SMH ERP solution in 1997. Initially the solution was RPG-based, but over the years the original programs have been extended and progressively replaced using LANSA's development and integration tools. The ERP system, still functioning faultlessly, now has a modern user interface, integration with TomTom WEBFLEET, dashboard overviews with MS Excel integration, EDI capability and a choice of digital communication formats BU's customers can choose from. Mobile apps created by SMH with LongRange, LANSA’s mobile app builder, allow BU's management access to all important company figures by using their iPads and iPhones. BU’s customer representatives in the field are equipped with mobile devices to access all relevant customer information. The SMH solution has supported Baustoff Union's exceptional growth and has helped to achieve dramatic efficiencies, such as a guaranteed delivery of stock orders within three hours of a customer placing an order and a stock turnover increase by a factor six. 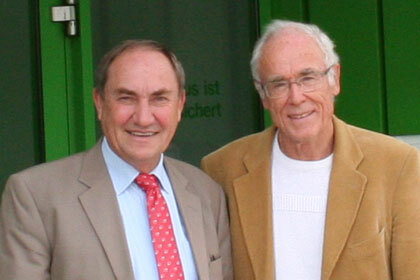 Otto Förtsch, Managing Director at Baustoff Union (left) and Siegfried M. Hartmann, Managing Director S.M. Hartmann GmbH. Baustoff Union is a leading provider of building materials, construction services and equipment rental services in Bavaria, the largest state of Germany. BU supports both professional builders and private customers with quality products and consultancy. BU Holding AG & Co was recently honoured as one of "Bavaria's Best 50" mid-sized companies (ranking number 4 out of 50), because of its exceptional growth in turnover and number of employees. Otto Förtsch, Managing Director of BU, acknowledges the award is a great success for a family owned construction company, especially in the current economic climate. He explains, "Our company is strongly customer-oriented and we have succeeded to establish ourselves as a recognizable brand in the market. This was only possible because BU and its partners are committed to very high quality standards. We maintain high quality through continuous training of our employees, as well as by consistently implementing ideas for improvement. In terms of technical equipment, we are always innovative and guided by the latest standards." As an example of innovation and customer focus, Förtsch mentions that BU has equipped its trucks, with specially developed cranes that can rotate 360 degrees and extend till a height of 28 meters. The full rotation and generous height make it possible for most construction sites to do the job with one crane instead of two, saving customers time and money. In the selection, implementation and continuous re-evaluation of its IT landscape, BU demands the same success criteria it provides to its customers: quality, innovation, value and cost optimization. These criteria led BU in 1997 to select IBM i (then called IBM AS/400) as its computing platform, due to its exceptional reliability, security and performance. In the same year the SMH ERP system was selected for its extensive functionality, ease of use and the availability of local support. In the selection, implementation and re-evaluation of our IT landscape we demand quality, innovation, value and cost optimization. Both the IBM i platform and SMH ERP solution have evolved over the years and today they still provide a modern IT environment that fully supports BU's growth and innovation. Förtsch says "The choice that we made over 15 years ago still proves to be the correct one today, even though market conditions and technologies have completely changed." The SMH ERP solution originally consisted of RPG code, which has been extended and progressively replaced with LANSA developed functionality, providing a smooth and low risk modernization path for SMH customers. "The faultless functioning of the SMH ERP system is of fundamental importance to our business success and so is our partnership with SMH. SMH supports us in all phases of development and maintenance and has always been able to very quickly implement our requirements," continues Förtsch. "The reliability of our ERP system is largely due to the knowledge and professionalism of SMH and the fact that we don't have to do any customizations ourselves." Siegfried Hartmann, Managing Director SMH, explains how his team keeps the customers happy and his company growing, "Since partnering with LANSA in 2006, we have all the tools at hand to create and maintain contemporary software applications and to modernize and enhance existing proven IBM i programs. LANSA's tools are cross-platform, so we can use the same skills for IBM i, Windows, web and mobile solutions, keeping our team lean." "We have used the LANSA tools very successfully for numerous projects," continues Hartmann, illustrating his point with a high ROI project example where LANSA Integrator developed web services were used to let BU's ERP system communicate information about routes and delivery orders with TomTom WEBFLEET. The solution allows BU's fleet controller to retrieve the current position of BU's trucks and selectively send a delivery job to the best positioned vehicle. "Using LANSA Integrator it was straightforward to get TomTom's web solution and our IBM i to communicate. SMH delivered the project on time and on budget," says Mr Förtsch. "The solution allowed BU to fine tune its procedures and has contributed to an efficiency increase of over 300% over six years. Customer service has also improved as BU can now guarantee delivery of stock orders within three hours of receiving an order, helping its customers to avoid expensive delays in building projects. We can now guarantee delivery of stock orders within three hours, helping customers to avoid expensive delays in building projects. Baustoff Union's headquarters in Nuremberg, Germany. BU is a shareholder of Hagebau, a home improvement and building materials chain with more than 1,400 locations, jointly owned by over 300 suppliers and retailers. Hagebau acts as a central purchasing association for its shareholders and offers warehousing facilities at its headquarters in Soltau and several other locations. BU continually needs to exchange information with Hagebau. For this SMH created special functions in the ERP system, using LANSA Composer, which automatically send outgoing orders to Hagebau in XML or EDI format. Hagebau then either fulfils the orders from its central warehouse or forwards the orders to the relevant suppliers. This solution was realized with LANSA Composer, a platform for integrating business activities involving transport, data transformation and custom business processing. LANSA Composer was also used to process incoming transactions. For example, it picks up the billing information of the individual suppliers directly from the Hagebau FTP server, compares the header and item data to the orders in the BU ERP system and automatically creates the corresponding links. Over 80% of the purchase orders and incoming invoices are currently processed this way, reducing the cost to monitor the process to a minimum. Further savings are expected when the invoices of other major suppliers can be imported. BU is also automating its sales invoices, giving customers a choice between EDIFACT, email PDF or customized formats. Several other recent IT projects have also helped BU to make its processes smarter and more cost effective. BU's Finance department, for example, evaluates all major divisions through a Windows based statistics/dashboard solution, developed with Visual LANSA that directly accesses BU's IBM i DB2 data base, with the option to extract data in Microsoft Excel. "The programs provide us with absolute transparency of all key metrics. It helped to increase the stock turnover ratio in the last ten years by a factor six," says Förtsch. We have absolute transparency of all key metrics, which helped to increase the stock turnover ratio in the last ten years by a factor six. Another highly innovative project involves mobile technology. SMH has extended its ERP system with mobile access, using LongRange, a native mobile app development tool from LANSA. The mobile ERP extension allows BU's customer representatives in the field to access customer information, pricing, stock availability and orders, and using GPS information map the best route to a customer. A second mobile app allows BU's management to use their iPads and iPhones to view key metrics and relevant company figures. "I'm pleased that we don't have to outsource mobile development to Objective-C or Java developers. LANSA has created LongRange specifically for developers with RPG and DDS skills, and there is also a version for LANSA developers. So, the same developers who maintain our ERP system are now involved in providing native mobile access to that ERP system," explains Hartmann. "We are confident to have found the right partner in SMH", concludes Förtsch. "SMH is inherently innovative, always interested in improvement and further development and committed to the highest quality standards - just as we are. Our two companies are a perfect match." I'm pleased that we don't have to outsource mobile development to Objective-C or Java developers. The BU HOLDING AG & co. KG, a family owned company employing over 1,100 staff, is in the business of construction and garden centers (OBI franchisee) and building material wholesale (Baustoff Union). BU's headquarter is in Nuremberg, Germany. The S.M Hartmann GmbH has been a reliable software and consultancy partner for medium-sized commercial enterprises for over 30 years. SMH/ERP covers all requirements and processes of modern companies.